Setting up a product catalog for Facebook can be a quick and straightforward process and implementing ads can give a huge boost to your online store's overall sales if the data is optimized and well-managed. 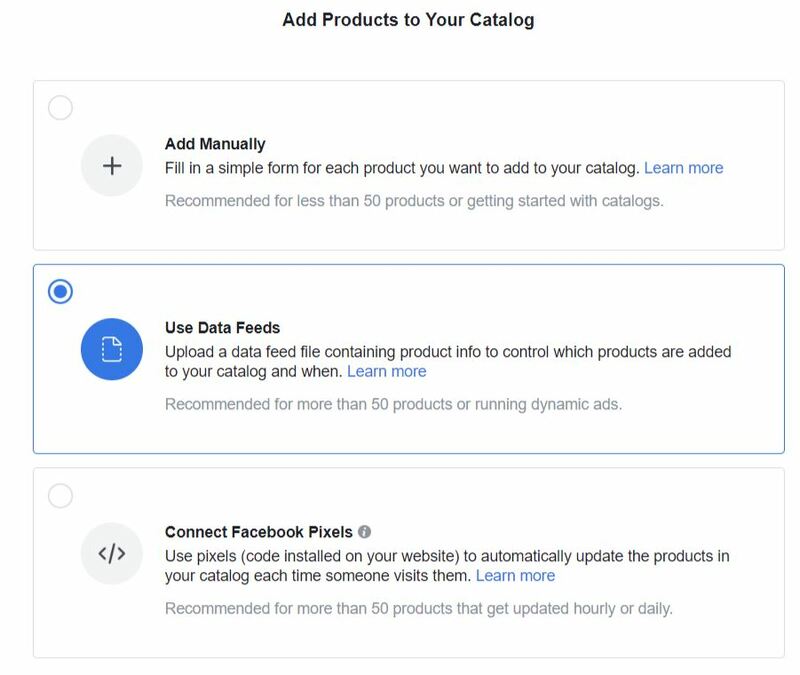 In this blogpost we take a look at the steps you need to take to launch your catalog for Facebook and how you can get connected and start selling. Anyone who wants to use Facebook Advertising will have to set up a Facebook Business Manager account first. As you'll see, this is a simple process and shouldn't take more than a few minutes. When it's all set up, the next step in the integration process is to create a product feed based upon the product catalog of your e-commerce store or webshop. "What is a product feed?" I hear you ask. This is simply a set of items from your store that you would like to display in your Facebook ads. An item is a single product from an online store, such as a Stock Keeping Unit (SKU). 1. First, login to your Business Manager account. Click on “Settings” and then click “Product Catalog” and "Add new product catalog" in the top right. 2.Give your product catalog a name (it’s usually a good rule to stick with the name of your store here) and click “Create Product Catalog”. Pretty straightforward so far right? Now let's set up your product feed. You'll then have the option to name your feed, as well as choosing the method with which you want to import - either via URL or File Transfer Protocol (FTP) (see image below, source). 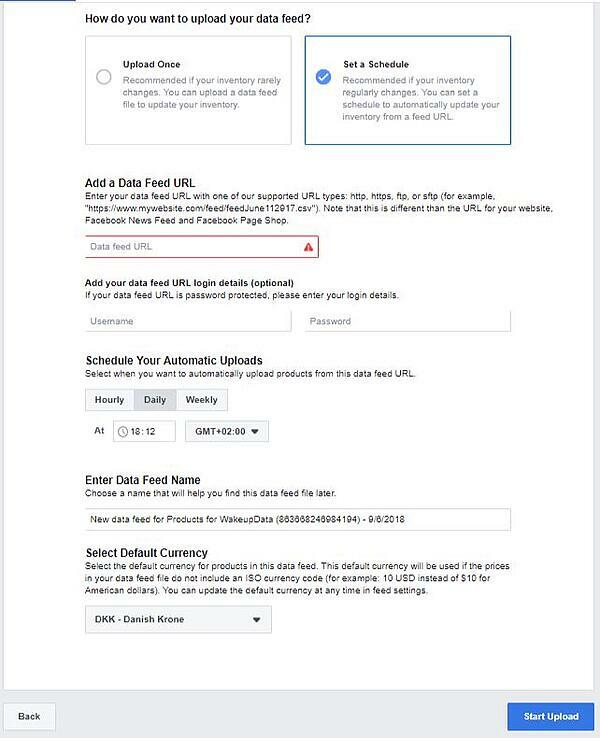 Once you're happy, select 'Schedule upload' and you have successfully imported your online store's product data to Facebook! If you want to get started straight away you can sign up below, otherwise read on to hear how you can manage your data once you've set up your Facebook Ads. Go your Facebook Business Account and to “Add Products” (image below). Then select how you want to add products to your catalog. In this case you will want to select 'Use Data Feeds' which lets you upload a data feed file from the WakeupData platform, with all your optimized product info. You will then be taken to a screen where you will name the product feed, tell Facebook where to get the feed, and how often they should get the feed. Again, retailers can auto-upload the feed with a URL or they can send it via FTP (file transfer protocol). If retailers are sending it via FTP they will put in the host URL, and plug in the Credentials to access that feed. Lastly, you will tell Facebook how often to grab the feed. We usually recommend updating the feed every single day. 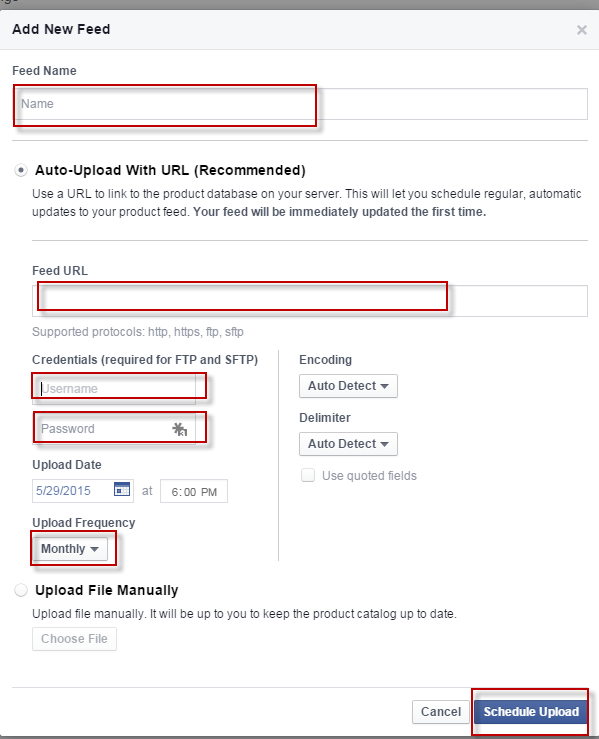 So that, in brief, was how you can set up a product feed for Facebook and get started. For more info, or if you're interested in hearing about how WakeupData's solutions can help you out - get in touch or download our free e-book: 'WakeupData 101'.